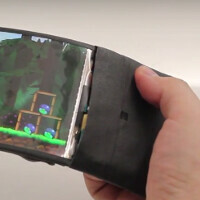 The ReFlex is a smartphone prototype that combines an LG bendable 6-inch 720 x 1280 FOLED screen with multitouch capabilities and a sensor which can determine how much the screen is bent. Unveiled by the Queen’s University Human Media Lab, the ReFlex uses the flexible screen to initiate certain features. For example, while holding down the right side of the display, online pages will flip through fingers from right to left just like they would on a book in real life. With Android 4.4 pre-installed on the prototype, the flexible screen tries to stay realistic, adhering to the laws of physics. For example, the more you bend the screen, the faster the pages of the eBook will flip. Playing Angry Birds, you can bend the screen in order to flex the slingshot. With the use of haptic feedback, you will be able to feel the slingshot tightening, or the pages turning on an eBook. The feedback allows you to navigate your location on an online document without looking at the screen. The ReFlex will be introduced today at a convention in the Netherlands dealing with interactions between computers and humans. Those involved in the creation of the device say that it is five years away from being commercially available. In the meantime, click on the video below to see the ReFlex in action. This is awesome. Flexible OLED displays is definitely something I'm looking forward to in the future. Anything what needs to keep being bent or moved will wear and tear. That's why they spend years testing these things before releasing them. I mean being honest that looks pretty useless and at least how it is presented in the video just another huge gimmick that will die out quickly. Interesting though I wonder how practical it is. This can be a new shift in smartphone technology. Only practical use case of bendable screens I can think of is transforming a SmartPhone into a Tablet. These use cases they demoed look gimmicky. I'd rather just jump to the page number than flip through multiple pages. If I don't know the page number a single quick swipe is sufficient to go through pages quickly while keeping an eye out for relevant page marks. Isn't this what Samsung demonstrated as something they too are working on? I mean they have curved displays. Now just make them bigger and bend more. It's all very pointless until ALL the components can bend, eg - battery. Or you end up with a phone like the one in the article with all the hardware stuck at the ends and is HUGE. Cool idea but 100% gimmick at the moment. I can't imagine any benefits of having a bendable phone. Why not one that emits attractive aromas or bird songs? I'd be very interested in lightweight, wearable technology. No more lugging around anything of size or extra weight nor having to worry about my portable armband device being stolen the moment I'm busy looking elsewhere. I think the ReFlex prototype is great in that it's lightweight, flexible, and especially because it utilizes haptic feedback (making any interaction feel more realistic and/or "old school." Definitely don't feel that it'll take five years to get this type of concept into the marketplace as similar prototypes are popping up all over the place now. I've also seen another wearable armband-type device, the Wove Band Flexible Display (can be seen on YouTube); the backing of which looks a bit "clunky" but perhaps this feature would enable it to have a much longer lifespan. A lightweight, very comfortable to wear, very clear to read, and very user-friendly/voice activated/wireless listening enabled armband-style personal computing device would be a dream come true for me. Can't wait. Remember the January 2014 Consumer Electronics Show in Las Vegas, Nevada, where LG debuted the world's first and only flexible 77" OLED (Organic Light Emitting Diode) TV? (And how just before that show was set to open, its rival Samsung held a press conference surprising everyone with their 85-inch bendable LED LCD TV announcement.) I remember wondering back then why anyone would want a flexible TV? Safety reasons, for sure, was my first thought since the larger smart TVs are so much lighter in weight for their size and way more easy to topple over and hurt someone, not to mention become more easily damaged. And the portability factor: How great to one day be able to roll up your TV and be able to take it anywhere with you without it being damaged along the way?